The photo above displays a simit, which is a Turkish bagel (and I’ve seen it advertised as such in some of the more touristy parts of town). While the simit is round and has a hole in the middle, the actual taste of it is more like Challah than the North American bagel. Why am I talking about food? 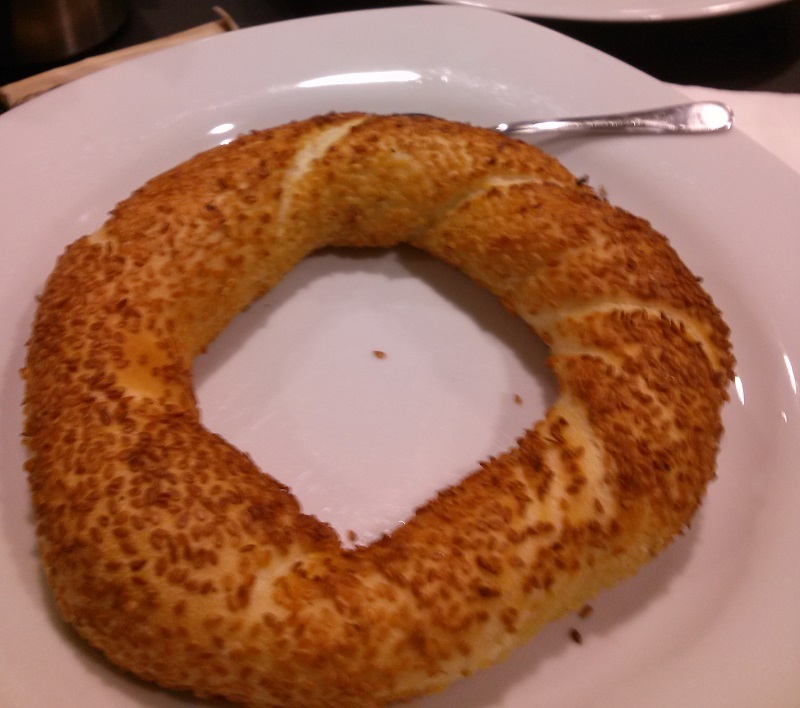 If the bagel is a staple food of the Ashkenazi Jews, then the simit is a ubiquitous street food in Istanbul, in the same kind of way that I’ve seen bagels sold on the streets in Poland. These parallels between culinary worlds has been reinforced time and time again to me when I’ve listened to the music and seen the dancing that’s going on in Turkey. I hear a lot of Turkish (particularly Thracian) inflections in klezmer music and to top it off, I performed a tune originally recorded in Istanbul at my concert in Amsterdam a couple of weeks ago. Jewish communities have been present within the borders of what is now Turkey for over two thousand years. And, from the information that I’ve been able to come across, there was relatively little persecution of the Jews in this part of the world, going as far back as the Byzantine empire, through the Ottoman period. Jews from Ashkenazi countries came to the Ottoman Empire and this area became a safe haven for the Portuguese and Spanish Jews expelled from Iberia in the late 1400s and 1500s. While the Jewish population was once a significant minority of the Ottoman Empire, Jews in Turkey only number about 17,000 now, most of whom live in Istanbul. That said, there are still musical connections all over the place. Much of what we think of as klezmer comes from the “Bessarabia” region of what is now Moldova and Ukraine. These areas are geographically close to Turkey and we know that there was trade and exchange going on between them. The “Terkisher” rhythm in klezmer is very much like Greek rhythms and Greece and Turkey have extraordinarily intertwined histories. While klezmer has resisted adopting many of more complex musical metres that are featured throughout the Balkans, the presence of the augmented second melodic feature in klezmer tunes is thought to come from Makams. Turkey appears to be an interesting place when thought of as a crossroads for the west and east and its role in klezmer is definitely something that needs to be explored more. There are just a few days left to contribute to KlezFactor: Europa on Indiegogo. You can make a difference and help us make Europa as good as it can be! Next → Next post: Time is Running Out!